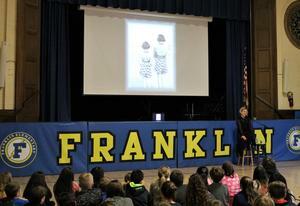 McKinley 5th graders welcomed Holocaust survivor Sally Frishberg on March 21. 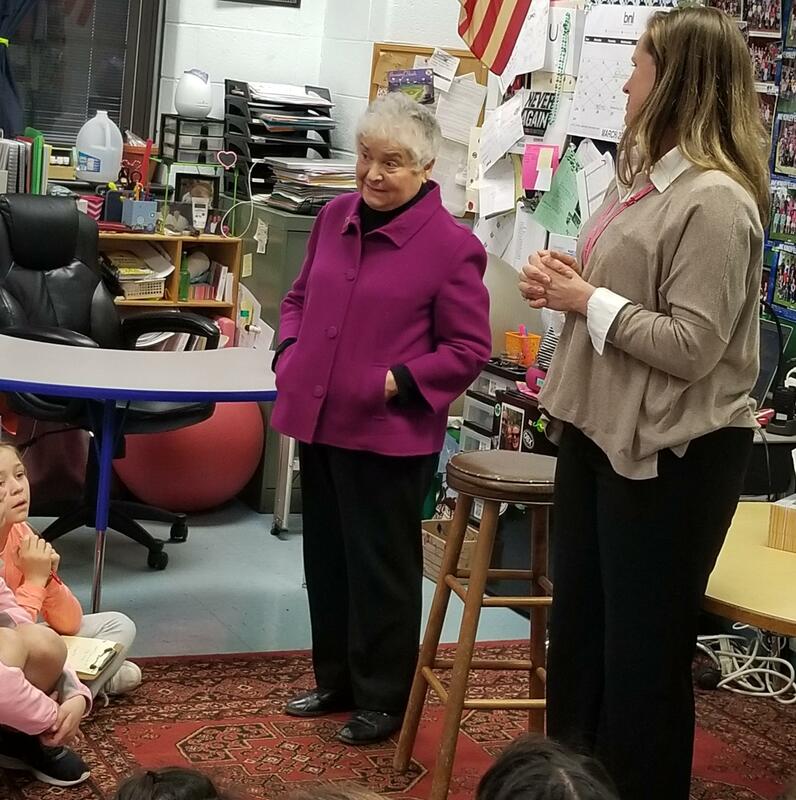 Born in Poland in 1934, Frishberg shared her experiences as a young child whose family was forced to flee their home in Poland when the Nazis invaded their village. She and her family were taken in by a Polish farmer and hidden in his attic for two years. After the war ended, the family eventually immigrated to America. 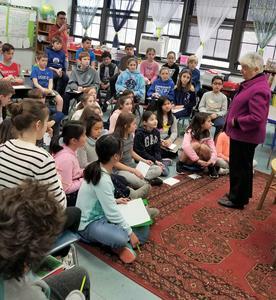 Frishberg, a former high school teacher, was awarded the Yavner Award for Excellence in Holocaust Education in 2005 and now is a regular speaker in schools. A mother and grandmother, she brings a message of hope and strength to her audiences. On April 1, through Living Voices, a Seattle, Washington-based organization that “combines dynamic solo performances with archival film and sound,” Franklin 5th graders listened as actor Elizabeth Rainer performed “Through the Eyes of a Friend” which is told from the viewpoint of a fictional “best friend” of Anne Frank. Sitting on a single stool, Rainer voiced the story of the fictional Sarah Weiss who becomes friends with Anne Frank, whose own real life story became known to the world after World War II through the writings in her diary. 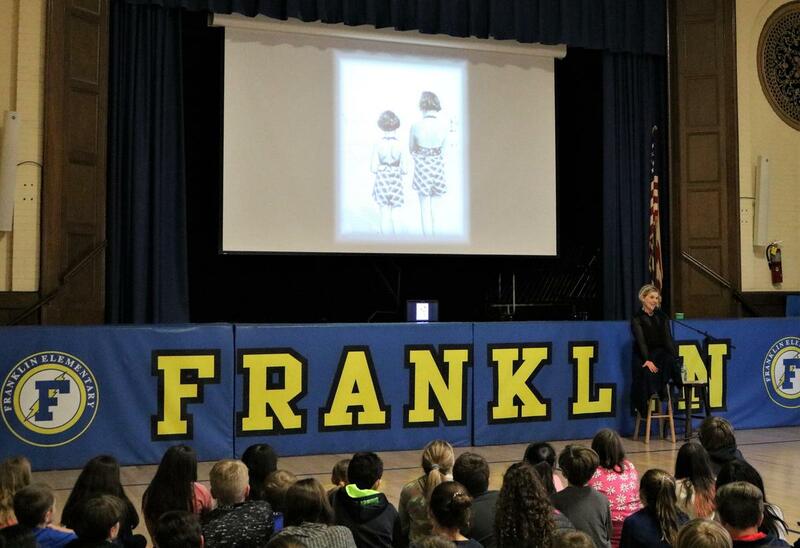 Through Rainer’s accomplished storytelling and historical photographs and footage, the 5th grade audience received a compelling account of the pain, loss, and hope experienced by the two girls as they are sent first to Westerbork prison camp, then to Auschwitz, and finally to Bergen-Belsen where Anne and her sister, Margot, died from typhoid. Their mother, Edith Frank, died in Auschwitz; their father, Otto Frank, survived. 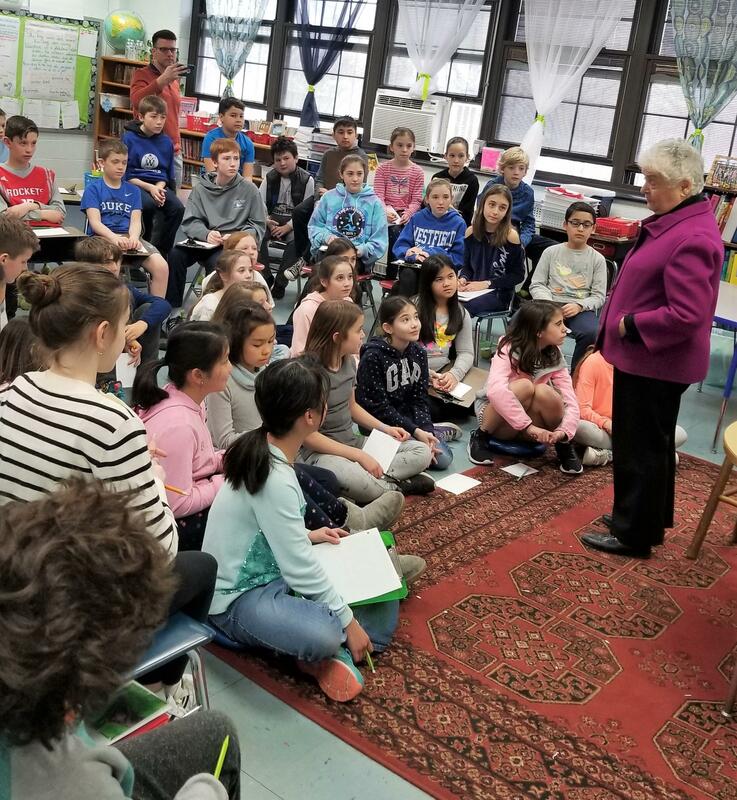 In recent months, 8th graders at Edison Intermediate School heard from Holocaust survivor Judith Reifer and from six members of the Second/Third Generation Holocaust Survivors Group from Congregation Beth Israel in Scotch Plains. 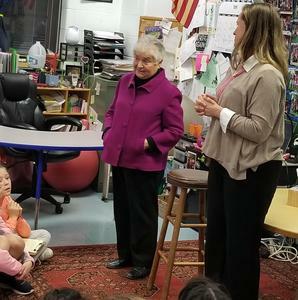 Tamaques 5th grade teacher Marisa Truselo is partnering with the Jewish Federation of Greater MetroWest to arrange a visit from a Holocaust survivor on May 31.